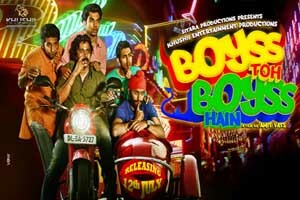 Boyss Toh Boyss Hain is 2013 Hindi comedy film directed by Amit Vats and produced by Chaitannya Swami and Anup Jalota. The film features Rajkummar Rao, Anshuman Jha, Dhruv Ganesh and Aarya Kumar as main characters. The soundtrack of the film is composed by Willii Saadhak and lyrics are written by Panchhi Jalonvi. Here is the link of all the songs lyrics and videos of Boyss Toh Boyss Hain.